A leading travel company that specializes in women-only expeditions has teamed up with female Ecuadorian, naturalist-trained guides for two itineraries that explore on land or from the sea the Galapagos, a UNESCO World Heritage Site. Wild Women Expeditions offers more active travel departures for women only than any other tour company in the world. Its programs in the Galapagos epitomize for owner Jennifer Haddow the importance of being part of the solutions emerging in places where tourism, among other issues, places fragile infrastructure at risk. The land-based, Galapagos Islands Multisport Adventure uses small water craft to explore the distinguishing features of some of the islands that reveal the pressures of a volcanic history that led to the formation of this archipelago. Guests hike to a volcano rim, kayak to beaches of docile sea lions, snorkel through fantasy worlds of colorful fish swarming a lava cone, and even while stand up paddle boarding bear witness to a bizarre birdlife that remains unafraid of humans, even after being the subjects of attention to throngs of curious passers-by. While hiking to the spot where Darwin’s HMS Beagle landed in 1835, the guide discusses Darwin’s theories and findings from his five-week exploration of the islands. On another day, a six-mile roundtrip hike leads up Sierra Negra, an active volcano with the second largest (6.5 mile span) caldera in the world where birdlife is abundant. The per person, double rate is from $5,495 for this 10-day Multisport vacation with dates of Nov. 11-20, 2017, and Nov. 10-19, 2018. Included are domestic flights from Quito, Ecuador, to San Cristobal in the Galapagos and Quito return from Baltra, plus related airport transfers; national park and transit control taxes and documentation; three nights camping on Galapagos Islands; six nights double occupancy in hotels; ground transportation and private group transfer by motorized boats between islands; all meals from beginning of program to end including a dinner with a local fishing family; four days of sea kayaking and wildlife viewing; one-day hike of Volcan Sierra; all gear and equipment related to programs including kayak, stand up paddle board and snorkeling excursions; and the expertise of English-speaking naturalist guides; Alejandra Mosquera and Africa Berdonoes. Born and raised in Quito, Alejandra Mosquera started guiding in 2004 and now divides her time between guiding and parenting. Africa Berdonoes grew up in the Galapgos islands, scuba diving since age12 and later becoming a Dive Master and guide. She once crossed the Pacific Ocean in a traditional Polynesian canoe, powered by wind and guided by stars. She holds an advanced degree in Protected Area Management. She believes the Galapagos can one day be an example of humans living in harmony with nature. 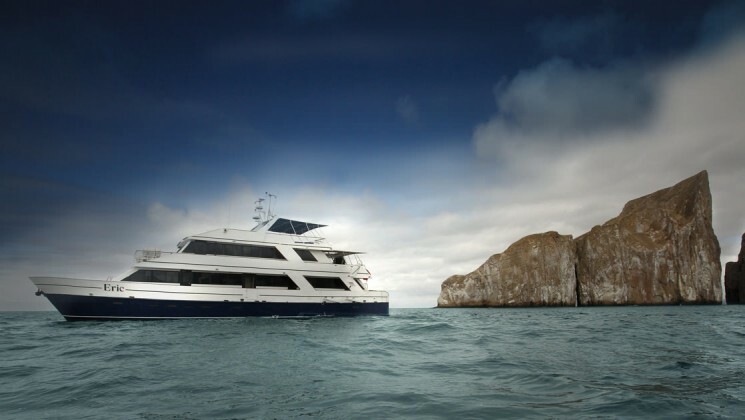 The cruise-based Galápagos Islands Eco-Yacht Adventure utilizes the M/V Eric a hybrid solar-powered vessel which incorporates some of the best conservation-focused technology in the world and sets the bar for environmental sensitivity for ships in the Galapagos. In accordance with Galapagos National Park protocol, M/V Eric’s route ventures through the islands on routes proscribed to minimize environmental impact. Twenty privileged guests travel aboard this luxury yacht enroute to bold discovery and quiet revelation while walking stretches of land that serve as nesting sites for clusters of fearless, air-born creatures or snorkeling and swimming alongside a friendly sea lion or following the trail to the dramatic ocean blow hole or watching colorful crabs crawling along the shoreline. A visit to Centro de Crianza Fausto Llerena (formerly the Charles Darwin Research Station) helps connect these experiential dots. The per person, double rate for this eight-day Nov. 26-Dec. 3, 2017, adventure on this solar-powered yacht is from $5,295. The rate includes roundtrip domestic flights from Quito to San Cristobal and related airport transfers; single, double or triple-berth accommodation for seven nights aboard M/V Eric; national park and transit control taxes and documentation; all meals aboard; complimentary use of wet suits and snorkeling gear and excursion and activities-related equipment such as sea kayaks and stand up paddle boards; guided hiking and Zodiac excursions; and the expertise of English-speaking naturalist guides; Malena Cruz and Gaby Espinoza. Magdalena “Malena” Cruz enjoys sharing her knowledge of sea currents, geology and the marine reserve. She studied to be a Tourism Professional Guide at the Universidad Internacional del Ecuador. When not guiding, she manages her family’s hotel on San Cristobal. Maria “Gaby” Espinoza holds degrees in science education from the University Estatal Guayaquil. Fluent in English and German, she became a naturalist guide in 1990. Conservation is her passion. Founded in 1991, Wild Women Expeditions is the world’s largest women-only travel company. Its initial focus was on canoeing on remote Ontario waters. Through an unwavering focus on Canada, one of the wildest, most pristine countries in the world, Wild Women Expeditions became experts in a pioneering niche that introduced small groups of women into wilderness settings. The company now hosts guests all over the world, offering more trips and more women-only, backcountry camping adventures than any other women’s travel company in the world. Cruise the Mediterranean with a local: PONANT.